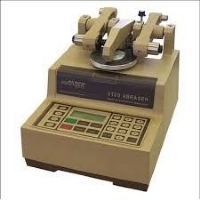 What you get: (1) vacuum system, (2) 500 g , (2) 1000g aux weights, (1 pr) CS-10 wheels, (1pr) H-18 wheels, (1) pkg refacing discs S-11, (1) pkg Specimen holding cards, (1) Specimen holders, instructions, hand tools and brush. PLUS FREE SHIPPING IN CANADA AND CONTINENTAL USA. Meets Many Various ATSM, DIN, ISO, TAPPI, JIS standards.